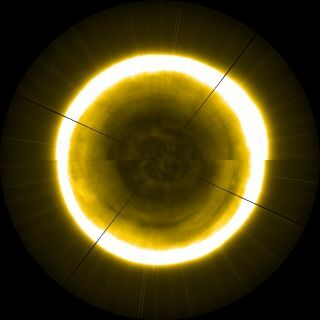 A gorgeous composite image of the sun's north pole, created using footage from the European Space Agency's Proba-2 satellite. Proba-2 launched in 2009 to observe space weather. It's not a complete picture — the ESA says we won't have one of those until the launch of the agency's Solar Orbiter mission in 2020 — but it does provide a good sense of what's happening just out of sight on the cap of our closest star. If you look at yesterday's image, for example, you can see a dark vortex bubbling around the pole's center. According to the ESA, that's a coronal hole — a thin region on the sun's surface where plasma is colder and less dense than usual, and more likely to eject blistering solar winds into space. Observing the poles directly will give scientists a clearer understanding of how the particles spewed forth from these coronal holes impact the rest of our solar system, including EarthAlas, those charged particles of solar energy probably won't make winter on Earth any warmer — but they might make it a little more colorful.